I got these photos clicked just before heading out for a wedding. I am not at all a Sari person ;rather you can call me a typical fuddy-duddy stereotype women who gets away in a suit/churidar whenever there is an urgent demand to dress up in an ethnic wear n that's about it ! I can be counted as one of those Indian women who get intimidated at the mere thought of wearing a sari ! I own approx eight sari's mostly in brocade n kanjeevaram which were handed over forcefully by my mom,after giving me a whole culture appropriate talk #mouthshut. 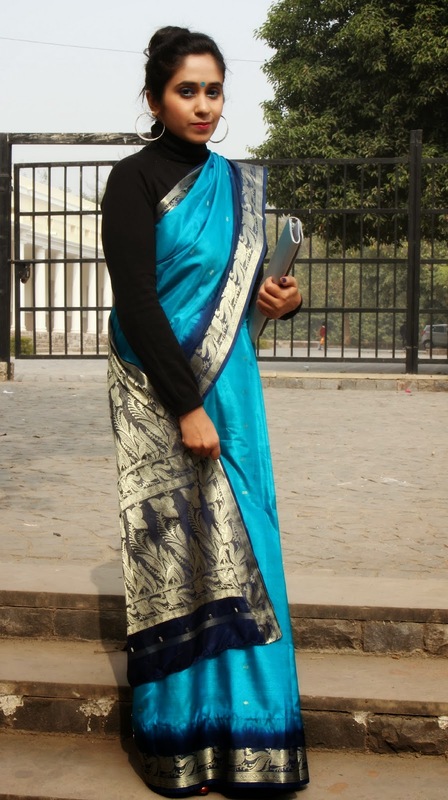 Recently my blogger friend Aditi from So- Saree mailed me about a blog feature on the theme Sari. 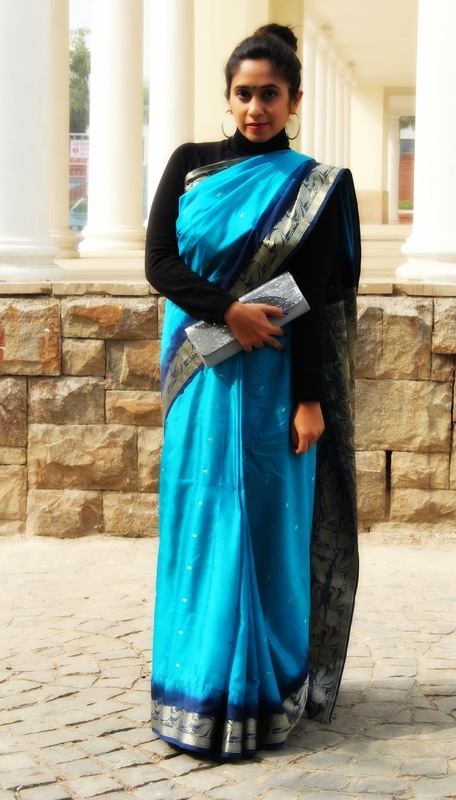 I gulped in a chunk of thought and decided to redeem a few of my precious Saris my mother passed on so lovingly, and do a style post for her ! 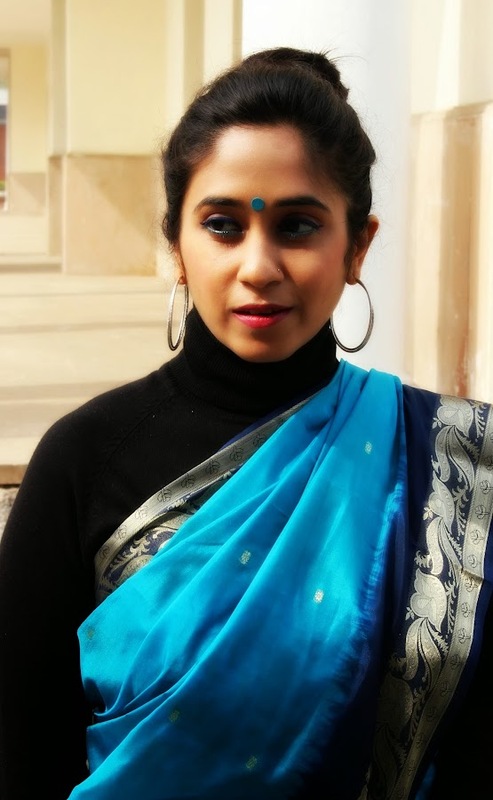 Sari for me is too constraining, and I got a lil spooked out to wear a blouse,especially when I had to put up with numbing days and arctic cold last month . Well ,when necessity becomes the mother of all inventions, I decided to bring more fun and alternate the blouse with my Zara turtle neck to give it a more indo western spin and a Bindi fix to work some Desi girl magic around and speak the language of elegance. You will find the same post on Aditi's blog too. Maybe you don't wear Sari often but you look great! You look gorgeous!! Love the look on you. Would you like to follow each other on GFC? Please let me know on my blog so I can follow back. Thank you. U look gorgeous..thnx for the feature. M telling u ..u need to do more posts in a saree..u look like a dream. Cool and traditional! I love it! and you look lovely in this. Adore your outfit! You look gorgeous! You look so fabulous with that sari, like a princess! That Sari looks so adorable on you. Blue is a fantastic color on you! Wow, that sari is really gorgeous and I adore the colours, you look stunning! I saw some beautiful silk sarees on Pothys.com . Check it out - http://goo.gl/FwgWeS.